"If you wish to experience value for money in the compact class, you won't be able to ignore the new Golf VI", gushes Hans-Jürgen Abt. The managing director of the world's biggest customiser of vehicles in the Volkswagen Group is very taken by the new version of the Wolfsburg "evergreen": "The new Golf is an outstanding basis for our designers and technicians - and they've already succeeded in creating five awe-inspiring predecessor series." For the ABT Golf VI, the Kempten company developed a sporty visual package perfectly geared to ABT's increases in performance and vehicle components. „Our Golf shows that driving fun and ecological points of view do not exclude each other," said Hans-Jürgen Abt, and highlighted the 1.4 TSI, which is available in two stages of expansion: the standard 122 HP (90 kW) become 160 PS (118 kW), and the more powerful version produces a proud 200 HP (147 kW) for the road instead of only 160 HP (118 kW). The "little" direct injection engine therefore produces almost as much as the next bigger series aggregate, the 2.0 TSI, but uses less fuel. "The magic word here is "downsizing", Hans-Jürgen Abt explained. However, for extremely power-starved fans the Allgäu company is also offering a power package for the 2.0 FSI: 210 HP (154 kW) will then become 240 PS (176 kW). The economically sensible alternative for regular drivers is the 2.0 TDI, which ABT Sportsline has given a powerful 170 HP/125 kW (standard: 140 HP/103 kW). In order for the power to be perfectly put into practice, ABT springs or the sporty ABT threaded suspension are recommended. ABT braking systems and ABT sports braking systems provide performance-related deceleration. But a real ABT does not just have to drive racily, but also look like it. For the Golf VI the designers developed a body kit that gives the hit model a dynamic and at the same time elegant look: front grill and apron make the car look more present, while the sidebars also make the ground look closer than it is. At the back, the rear spoiler and rear apron attachment, in which the slanted 4-pipe exhaust is integrated, become the central elements. 18 or 19-inch AR and BR rims round off the appearance. Of course, the elegant wheels are also available in combination with the matching sport tyres. 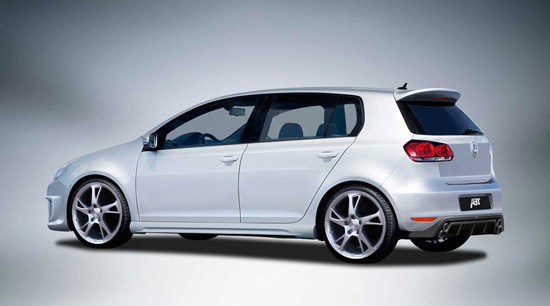 One thing is certain: with the new ABT components, the Golf VI rolls stylishly into the spotlight. The newbie is a real highlight, because this is the sixth time that the ABT's have produced a Volkswagen for individualists.